Check your CIBIL Score & Report absolutely FREE in next 2 minutes. Already checked your score before? LOGIN To see your detailed CIBIL Report. CIBIL requires accurate details to ensure accuracy & security. No thanks. I’m only interested in checking my CIBIL Score. 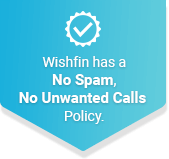 Wishfin has a No Spam, No Unwanted Calls Policy. CIBIL score or credit score is a numeric representation of the repayment history. When you apply for any credit facility (loans or credit cards) the lender checks your CIBIL score and your credit history. On the basis of the score and the credit hisory, your application is further processed. As CIBIL’s first official partner, Wishfin gives you the opportunity to check your CIBIL/Credit score for free by PAN card! You may now learn - how is CIBIL score generated and how can you check it online. How to Check Free CIBIL Score Online? To get free CIBIL score online the customer can login on the official website of the credit agency and request for the report. Also, to get the report the customer has to furnish the required documents. It is only after the verification of documents that the customer will receive the CIR through email. The report will be sent within a day. How to Check CIBIL score by PAN Card? You can check your CIBIL by Permanent Account Number (PAN) and some basic details. The score can be checked within 2 minutes by following the simple steps mentioned below. As you soon as you complete the above process, you will get your latest CIBIL Score in your WhatsApp chat box. The other way to get your CIBIL score via WhatsApp is to fill up the form and the link, through which you can check the score, will be sent to your mobile number. You can login to your account using CIBIL login details and get detailed CIBIL report free for one year. What is a CIBIL/Credit report? This report provides lenders the detailed information of the applicant’s creditworthiness on the basis of previous and current credit behaviour. Based on the report,lenders take the lending decision. Is Wishfin an Authentic Partner of CIBIL? 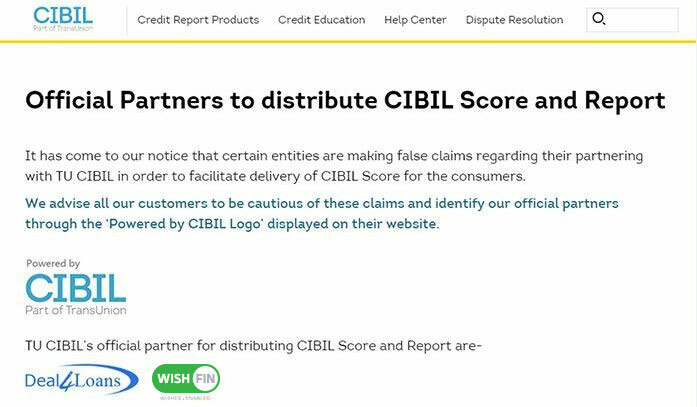 Wishfin is first official fintech partner of TransUnion CIBIL – the company that provides you your official CIBIL score. We are sharing below the screenshot of the authentic partnership by CIBIL. You can also check it on the CIBIL website through this url below. Will checking CIBIL multiple times hamper overall credit score? No, you can check your CIBIL score at Wishfin as per your will without making a dent in your overall credit worthiness. If otherwise you go and apply for loans directly at bank or NBFC then the score can fluctuate a bit. A good credit score makes a person eligible for better deals on loans and credit cards. Having a good CIBIL score not only gives access to more options, it is also an important factor in deciding payment habits of individuals. Credit facilities such as a credit card or loan are provided based on the present employment status of the customer also on their CIBIL score. What are the benefits of having a good CIBIL Score? However, it does not mean that if you have a bad CIBIL score, you can not get a loan or a credit card. Many people get loans and also use credit cards even if they have 0 or bad CIBIL score. But - beggars are not choosers. There are surely some advantages of being on the good side of the scale. So, here are some of the benefits of maintaining a good credit score. Increases eligibility for loans - CIBIL score is the numeric representation of payment history. If you have a good credit score, the lender will be interested in giving a loan to you. Gives access to best Credit Cards - Some of the great credit cards require a specific credit score which will be accessible to you only if you have a good credit or CIBIL score. Authenticity for a lower rate of interest - Especially in the case of loans, those having a positive payment history and credit score are more likely to get a lower rate on loans in addition to their present repayment capacity. To build a credit history - Just in case, you have zero credit history and score, the moment you start using a credit card or paying EMIs, your credit history will build up and so will your credit score. This will make you eligible for better options in the future. How is CIBIL Report Generated? Credit Information Bureau of India Limited (CIBIL), India’s first Credit Information Company collects and maintains the records of individual’s and non-individual’s (commercial entities) credit related transactions such as loans and credit cards. These records are provided by banks and other lenders on a monthly basis to the Credit Bureau. Using this information a Credit Information Report (CIR) and Credit Score is developed. This enables the lenders to evaluate and approve loan applications based on the past record. The member banks and financial institutions monthly report the details related to credit activity of the customers to the bureaus. This includes data of each loan or credit card repayment made by the customer during the period and even the late or skipped payments. The report comprises of new loan applications, interest rate, credit limit on card, the status of all loan accounts including those ‘written-off’ or ‘settled’ or ‘closed’. After the complex statistical analysis of the provided information credit score is calculated. If credit payment is done on time then the score is good. The candidates with high credit score have the better chances of getting a loan or credit card.